This year’s winning selections, chosen by over 50,000 student votes, are The Boy on the Porch, winner of the 2016 Charlie May Simon Children’s Book Award. Prisoner 88 by Leah Pileggi is the 2016 Charlie May Simon Honor Book. 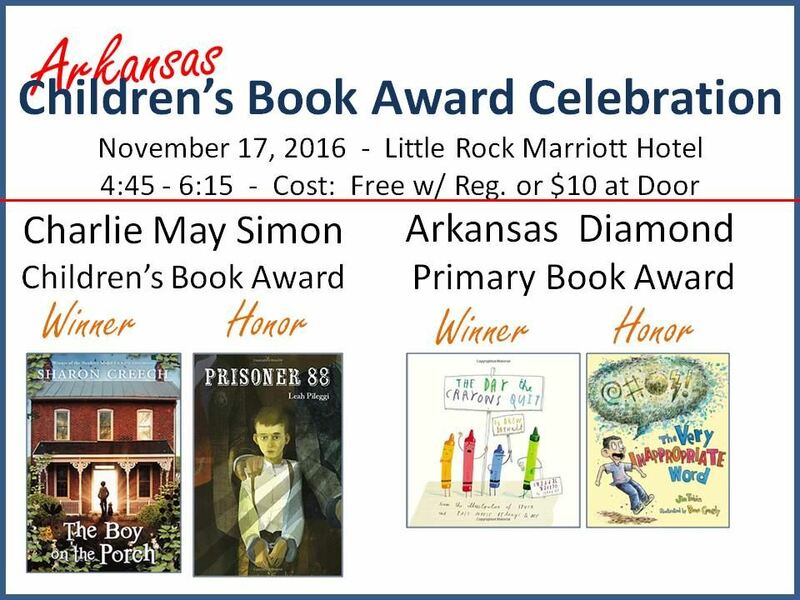 The Day the Crayons Quit written by Drew Daywalt and illustrated by Oliver Jeffers is the winner of the 2016 Arkansas Diamond Primary Book Award. The Very Inappropriate Word written by Jim Tobin and illustrated by Dave Coverly is the 2016 Arkansas Diamond Honor Book. Charlie May Simon Honor Book winner Leah Pileggi will be attending the event and will sign books along with other conference presenters including: Margaret Peterson Haddix, Dana Sullivan, Alan Gratz, Denise McConduit, Anya Wallach, Michael Shoulders, Christina Diaz Gonzalez, and John Holland. Arkansas authors who will be there are Maria Hoskins, Darcy Pattison, Carla Killough McClafferty, Victor Biton, James Babb, Ann Averitt, William B. Jones, Simply Shonda, and Caryn Southerland. Tickets are free with ARA conference registration or tickets to this event only may be purchased at the door for $10, which includes admission for one adult and up to 3 children. Refreshments will be served. The Charlie May Simon Children's Book Award for children's literature has been presented annually since 1971 to an author whose book has been selected through a vote taken by Arkansas school children in grades four, five and six. The Arkansas Diamond Primary Book Award was established by the Arkansas Elementary School Council in 1998 to encourage reading for students in Grades K-3. Like the Charlie May Simon Award, the Arkansas Diamond Award is selected by an annual vote. Children in Grades K-3 must have read at least three of the titles from the annual reading list and may vote for one title. Both awards are under the sponsorship of the Arkansas Department of Education, the Arkansas State Library, and the Arkansas Reading Association, with support from other cooperating organizations.